Home / Tech news / This Robot Will Go To Work Instead Of You? Getting yourself out of bed and into work can feel like one of the toughest parts of the day especially when the alarm hits you up. solution, albeit a very Silicon Valley one. At the Beam shop in downtown Palo Alto, California, the employees come from all over the world, including Bermuda and Kansas City, but face none of the normal commuting grumbles. 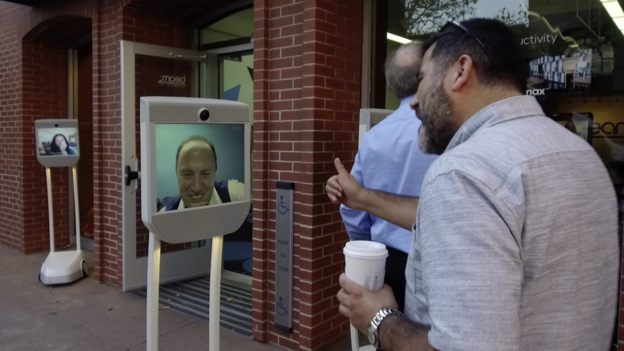 Instead of physically dragging themselves to work, staff "beam in" to the shop to operate robot versions of themselves from the comfort of their own homes. The robots unlock the shop doors, adjust the lighting and temperature, swivel about to answer customers' questions and as a special party trick hand out sweets to curious passers-by. 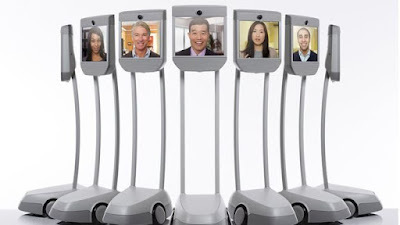 The robot's movements are controlled via a computer's mouse or arrow keys and its operator uses a webcam to display his or her face on a large screen. The sight of a huge head displayed on what looks like a TV on stilts careering around the shop floor is both comical and slightly terrifying. But Scott Hassan, founder of Suitable Technologies, which makes the Beam robot, says in his company - where staff can work remotely - they're now used so frequently no-one bats an eyelid. Mr Hassan has even devised his own lingo for the situation, calling people physically present "meat bodies" to distinguish them from the robots. "This is sort of futuristic for a lot of people [so] they probably don't understand what that would feel like. But once you know somebody and work with them, just because they're on a Beam doesn't affect it. It's just as if they're there," he says. In some cases he says regular customers have not only managed to get past the robot exterior, they've ended up in a relationship with the person manning the robot. For those so inclined, the machines have a "party mode", which cancels out background noise making intimate chats easier. "They're really just humans talking to humans from a distance. If you use a Beam long enough you very quickly lose that emotional distance," says Mr Hassan. Mr Hassan has pedigree when it comes to technology. The billionaire previously helped write the code that led to the creation of search engine Google and is reported to have made millions from his early stake in the firm. He went on to found group email messaging company eGroups, which he sold to Yahoo, before founding his own robotics research laboratory Willow Garage. Mr Hassan came up with the Beam due to his frustration that, despite existing technologies such as video conferencing, email and chat, remote workers still felt isolated, and he says the subsequent miscommunications were leading to mistakes. But now the robot is in use, he says it also offers firms another advantage: a way to recruit staff from a much bigger potential pool of people. "Being able to get talent from anywhere in the world is valuable to companies, and so our product allows people to live somewhere and work somewhere else," he says. It's something the Silicon Valley-based firm, where the starting salary of a software engineer can be as high as $160,000 (£127,000) a year, has done itself. "For a little start-up company, it's tough to compete. So what we do is we just go elsewhere. And so other companies can do the same things with our products: hire abroad where the cost of living is much lower," he says. Business customers named by the firm include Power Bright boss Gil Hetzroni, who uses the Beam to oversee his company's factory in China, and Microsoft Research, which says the Beam enables its staff in Russia, India and China to have casual chats in the same way as if they bumped into someone in the hallway. Their use is not restricted to work. In 2015, the firm partnered with various US museums to give people unable to travel due to a physical disability the chance to explore the exhibitions using a Beam. Suitable Technologies is coy on just how many Beams - the cheapest of which starts at just shy of $2,000 - it has sold, but says there are "thousands of Beams in service around the world". Nonetheless, Mr Hassan admits selling the concept is "challenging". "It's new, it's something that is outside the human experience," he says. But he believes that by giving a remote member of staff a physical presence, no matter how unrealistic it may seem, means they are listened to and respected more. He says the Beam also enables managers who are not physically present to monitor their staff more easily. "It's the looking someone in their eye, that kind of stuff. "They can ignore you on your phone, on your email, on your texts if they want, but when you roll right into their office it's hard to ignore a Beam," he says. The company is competing with several rivals, including Double Robotics and Anybots who make similar products. But Mr Hassan says he is constantly working on improving the sophistication of the Beam to make it more realistic, including eventually a flying version. While the Beam may seem futuristic, Mr Hassan says such things will become commonplace as technology advances. "Once you see a computer moving into doing the things that you can do you should join it rather than resist it because you will lose eventually," he says. It's advice that chief executive coach and author Steve Tappin says those running firms need to heed. "Technology will turn the world of work upside down. "Most CEOs have got no clue about it and unless they wake up they'll be replaced by leaders that do," he cry out loud.